Regulate the output of Goal Zero Yeti 1000, 1400 and 3000 lithium power stations to a consistent voltage with the Goal Zero 12V regulated cable for improved compatibility with 12V powered devices. The Goal Zero 4X 8mm combiner to Anderson connector lets you combine 2 or more Goal Zero solar panels with 8mm outputs into an array, letting you power your campsite with energy from the sun. Goal Zero 8mm Input Extension Cable - 15 ft.
Connect your solar panels to each other or hook one up to your Goal Zero Yeti power station (sold separately) with this 8mm Input 15 ft. extension cable-a rugged 16-gauge extension cord. Goal Zero 8mm Input Extension Cable - 30 ft.
A burly 16-gauge extension cord, the Goal Zero 8mm Input 30 ft. extension cable lets you connect your solar panels to each other or hook one up to your Goal Zero Yeti power station (sold separately). Couple these four Goal Zero AAA rechargeable batteries with the Nomad 7 solar panel and Guide 10 Plus (sold separately) to breathe new life into them over and over, wherever you wander under the sun. Charge your solar panel in the sun while chill in the shade with this Goal Zero APP extension cable. It lengthens the charging cable on the the Goal Zero Boulder 200 briefcase by 15 ft. When your basecamp or cabin is off the grid, capture the sun's power for your electronics with the Goal Zero Boulder 100 solar panel. Its rigid design is great for temporary or permanent installation. 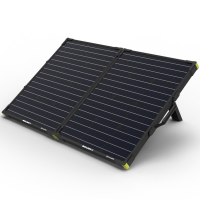 Combining the strength of a rigid panel with the convenience of a folding design, the Goal Zero Boulder 100 solar panel briefcase consists of two powerful Boulder 50 solar panels hinged together. Harness the power of the sun on your next fairweather adventure with the Goal Zero Boulder 200 solar panel briefcase. It delivers 200 watts and pairs perfectly with larger portable power stations.